Seth MacFarlane: TV's 'Family Guy' Makes Music, Too MacFarlane is best known for creating the animated TV shows Family Guy, American Dad! and The Cleveland Show. But he's also a singer whose new album features songs from the Great American Songbook. 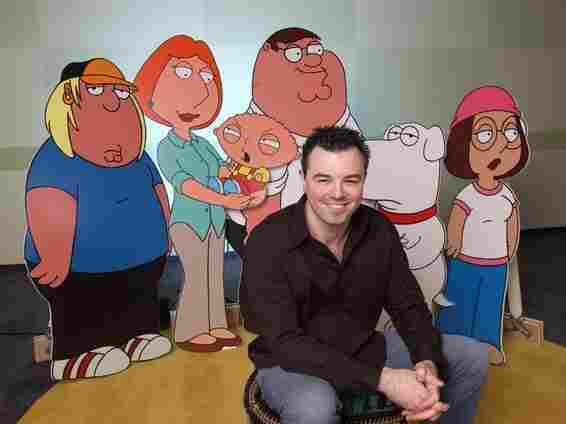 Seth MacFarlane is the creator of the animated sitcoms Family Guy, American Dad! and The Cleveland Show. When Family Guy creator Seth MacFarlane was growing up, his parents exposed him to Broadway, movie musicals and the Great American Songbook. Meanwhile, his cousin Shep introduced him to Woody Allen. "I instantly became a huge fan of his movies," MacFarlane says. "When Radio Days came out, I bought the soundtrack and got to know all of the songs. ... Radio Days was full of [old songs from the 40s]. So I went to my grandfather and [asked] for more stuff, and he gave me a bunch of his old record albums, and I really became acquainted with Tommy Dorsey and Glenn Miller and that era of music." MacFarlane's new album, Music Is Better Than Words, is a collection of songs sung in the big-band style and taken from the Great American Songbook. Many of the tracks were tunes originally recorded by some of the great singers of the '40s and '50s. "This kind of music is what I've always been drawn to," MacFarlane tells Fresh Air's Terry Gross. "[I think] the Great American Songbook, and particularly the early- to late-'50s era of orchestration, was the peak of high musicality as far as what singers and orchestrators were doing with relatively old songs from the '20s and '30s. [They were] just breathing new life and energy into them as they discovered what they really could do with an orchestra in popular music." MacFarlane says he started taking vocal lessons from Lee and Sally Sweetland, who trained Barbra Streisand and Frank Sinatra, among others. "They really drill you," he says. "They teach you the old-style way of singing, back when you had no electronic help. ... [They teach you to] show your teeth. If you look at old photos of Sinatra while he's singing, there's a lot of very exposed teeth. That was something that Lee Sweetland hit on day in and day out, and correctly so, because it just brightens the whole performance." Though Music Is Better Than Words is MacFarlane's first studio album released under his own name, the comedy writer is no stranger to a recording studio. His voice can be heard throughout the many musical numbers on Family Guy as the voice of both Peter Griffin and his son Stewie Griffin. "Singing in character voices is actually a hell of a lot easier than singing straight, because it's almost like there's a shield around it," he says. "We assume Peter Griffin probably shouldn't be able to sing all that well, so you can keep it loose and you don't have to think too much about it. It's much more work to sing straight." MacFarlane also wrote and voiced Family Guy's theme song — and then fought network executives for its survival. "We had to fight pretty hard to do a theme. ... It's a tradition that's kind of going away, and part of that is the networks are worried that people don't want to sit through the same thing week after week, and so shows are being discouraged from writing themes," he says. "I think what [executives] don't realize is, showmanship is showmanship. It hasn't changed in hundreds of years. It's a drum roll saying, 'Here comes a show.' ... And it gets the audience psyched up. ... And I think the absence of that is really tragic." MacFarlane also fought for the theme song in his second Fox sitcom, American Dad! But by the time The Cleveland Show aired, he says, Fox executives had stopped discouraging him. "Luckily, by the time The Cleveland Show came out, we never even heard anything from the network about that," he says. "I think by that point, they realized it was a stylistic thing for these shows — that you need a little bit of a drum roll. You need a little bit of a P.T. Barnum intro." On Fresh Air, MacFarlane also details his early forays into comic writing, and describes what it was like to host Charlie Sheen's roast. MacFarlane has won two Emmys and a Webby Award for Film and Video Person of the Year. "I think of it as, I'm living the same way in 2011 as I was in 1999. And the reason for that is I had missed a lot of flights. I'm a perpetually late person, and every flight that takes off, you have to figure somebody's going to miss the flight or somebody's late. And on top of that, who knows how many times a day we have similar close calls as the one I had? This morning, crossing the street, if I had crossed five minutes later, I would have been hit by a car. Who knows? So in my case, obviously the day itself was a tragedy and a disaster, but if we're just talking about my case, it doesn't strike me as something that I am attaching an unbelievable amount of significance to because of those reasons — because I have missed a bunch of flights." "The orchestral musicians had to have been the best musicians out there. The tempos are all over the place. It's just so frantic, stop-and-go. And it's insane how hard that is to play — harder than most film scores, because you just have to be watching the music and the conductor, and the whole tone changes every few seconds." "The animated musicals that Disney did in the '90s were very noteworthy. For me, The Muppets were more legit than anybody in that regard. The Muppets and even Sesame Street — Joe Raposo, the great jazz composer, wrote so many great songs for Sesame Street and The Muppets. Sinatra recorded "Bein' Green." Bing Crosby recorded "Sing." The Great Muppet Caper — every song in that movie is a great Joe Reposo song, and at some point, those are songs that I'd like to record." "I had been studying animation for a while, and when The Simpsons came about, I was interested at the time in becoming an animator for Disney. Disney was having their renaissance in the film world with movies like The Little Mermaid and Beauty and the Beast. And that was what I wanted to do, and then here comes The Simpsons, who said, 'Hey, you can also do this. We're rewriting the rule book with regard for what you can do on television.' And I was laughing. This was something that actually was for me. It wasn't for a family audience. It was for me as a single guy with an edgier sense of humor and what I was looking for. I was laughing genuinely at this stuff. I was doing standup at the time and enjoying that, and enjoying working with risque humor, so I decided to develop an animated idea. I looked to my own region in this case, where I was brought up, for character ideas. Peter Griffin is very, very much the quintessential big, fat, loud New England guy who is very, very good at the core — big-hearted guy — but just has zero self-editing mechanism. No idea what is appropriate and inappropriate, and you kind of have to forgive him because he just doesn't know any better, and I knew so many of those guys. My father knew tons of those guys when we were living back East." 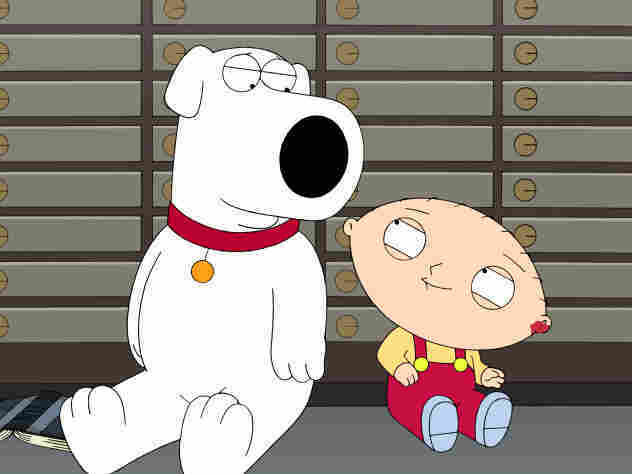 Seth MacFarlane voices several characters on Family Guy, including Brian (left) and Stewie (right) Griffin. "Stewie was originally just a dopey-looking drawing of a baby with no personality. I had the rest of the family conceived, and I was just looking for something that would give him a personality — which was essentially what Maggie Simpson was. And I was a big Rex Harrison fan — there was something about him that I found amusing and ridiculous — and so I came up with the idea to put Rex Harrison's voice in the body of this baby. And thus Stewie was born."